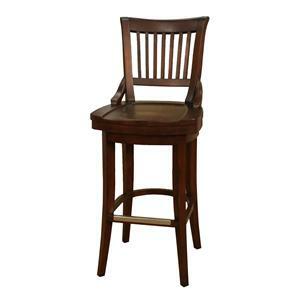 This stylish and casual 24 inch Liberty bar stool will be a wonderful addition to your bar or casual dining area. It features mortise and tenon construction, a return swivel, fully integrated back support, and floor glides. Rest your feet on the comfortable footrest while enjoying a glass of wine with a couple of your best friends. 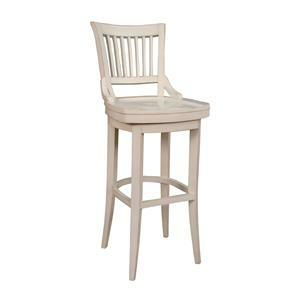 This bar stool is available in three splendid colors: antique white, black, and suede. The Bar Stools 24 Inch Liberty Bar Stool by American Heritage Billiards is available in the area from FMG - Local Home Furnishing. Furnish your home with one of these simple and elegant bar stools. These bar stools are perfect for lounging, while enjoying a glass of wine after a busy day of work. Choose from a number of different finishes to find the perfect bar stool for your home! The Bar Stools collection is a great option if you are looking for Casual furniture in the area.